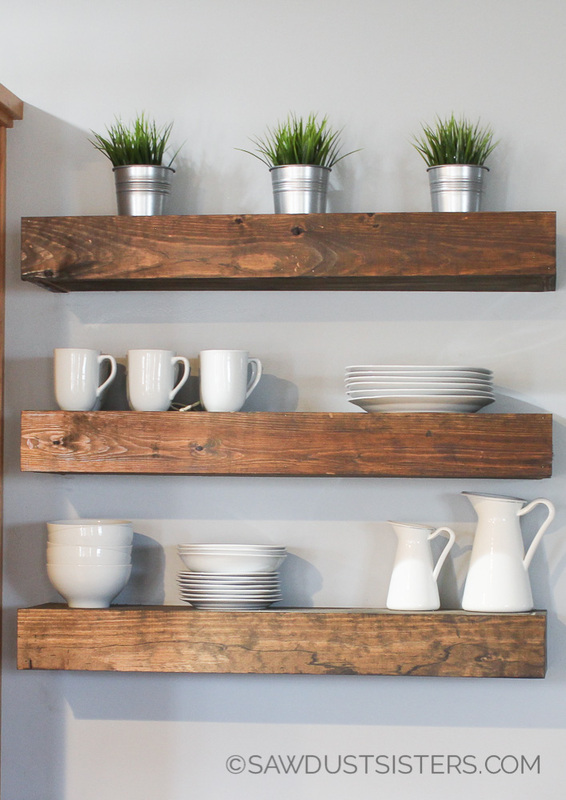 DIY floating shelves are a perfect addition to any room!. They are cheap to build and so heavy duty! A pretty easy build, too! A few boards and some screws. I now have a set in my kitchen and another in my son’s room. Do you have a wall crying for these? I know you do! The ones in my son’s room are longer. I really love how they turned out! This post contains some affiliate links. Click here to see the full disclosure. First you will build the frames out of 2 x 2s. 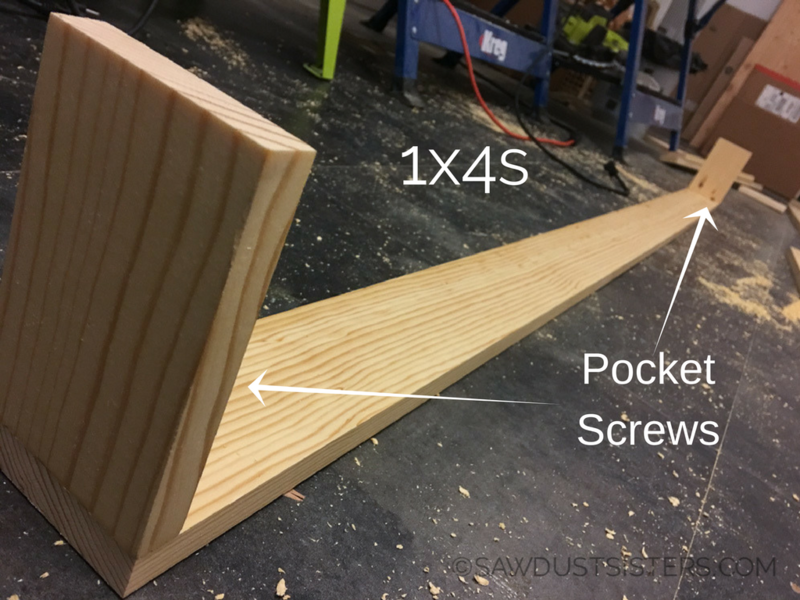 Using a pocket hole jig , drill pocket holes and attach with pocket hole screws and wood glue. 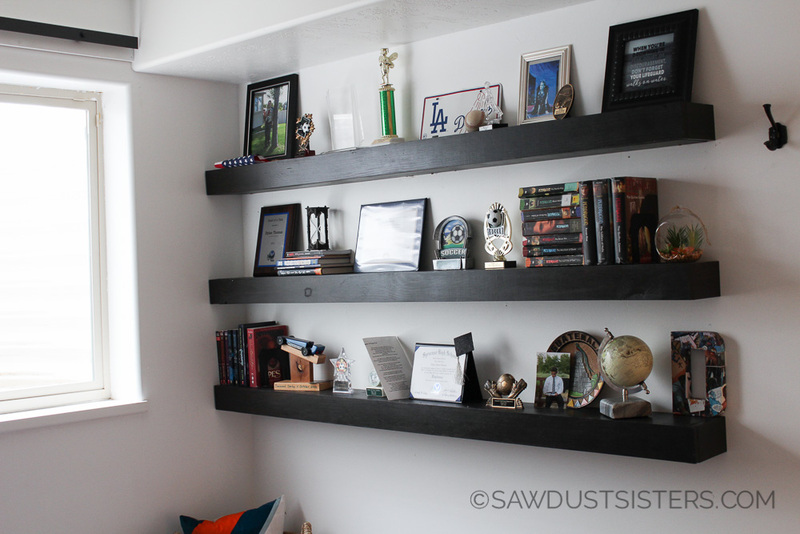 To build each shelf box for your diy floating shelves, begin by attaching the 1x4s together as shown. 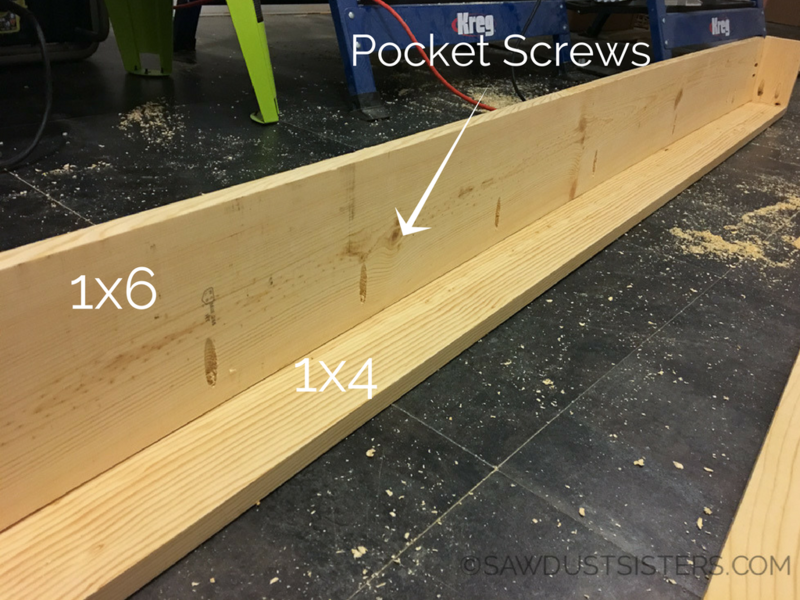 Drill pocket holes and join with 1 ¼” pocket screws and wood glue at the seams. To finish off the box, secure the sides with brad nails. I used my favorite nail gun for this part! At this point I highly recommend you paint the boxes. It’s a lot easier to do it before they are attached to the wall. I used this stain for the kitchen shelves and this darker one for the bedroom shelves. This is the funnest part!! To secure them unto the frame, drill wood screws from the bottom of the shelves into the 2×2’s. This will keep them from sliding. Step 6: Fill them up with all the things!!! I used to have all of my son’s high school memorabilia on a small bookcase or stuck inside a drawer. Now it is part of his room decor! What do you think? And Pin them so you won’t forget them! Oh, how I love them! I will have to tackle this project one day soon. They look stunning in your home! Thank you so much Carolann!! I hope you get to make them soon! Hi Debbie! The long pieces are attached with pocket screws. It’s actually not a problem to fit the second long piece, as long as you use the longest bit that comes with the kreg jig. I used brad nails only on the top of the sides. I hope that makes sense 🙂 I’m glad you liked them! Thanks Tom! I had someone else mention this too. I’ll have to modify the plans. Thanks for commenting and clarifying this for everyone! would these be strong enough for daily use in a kitchen?